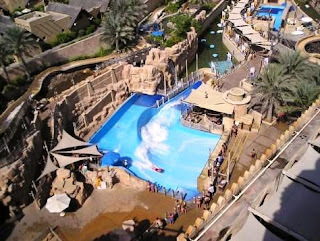 Wild Wadi Water Park Dubai including the best attractions in Dubai which can be used as a place to spend time with family members. This place is situated in Jumeirah, close to the Burj Al Arab. 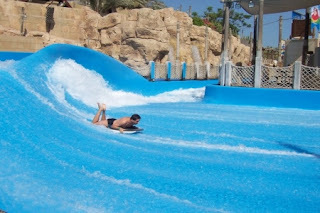 Current pool is the largest in the Middle East, with a height of almost 1.5m waves. Although there is no age limit to enjoying this arena, the children should remain under the supervision of parents. 100.000 liters pond water contains a high wave reached 1m. Just like the Breakers Bay, this arena has no age limit and provide a protective coat for the visitors buoys that can be obtained free of charge. A vehicle in the form of a closed sliding quite frequently visited than other vehicles. This is necessary to slide down the rubber tires, can alone or together. This vehicle is prohibited for those who have heart disease and phobias of darkness. Likened to a roller coaster of water, consisting of Flood River Flyer, Wadi Leap, White Water Wadi, Falaj Fury, Wadi Twister and Wadi Basher. Here you can get the experience of surfing the perfect wave effect. It is also a vehicle for surfing, but you can invite family members. Get an unforgettable joy to surf with them. Not only a wide selection of water rides for the activities provided. Here there are two souvenir shops so you do not go home empty-handed, and there are also three restaurants that are scattered in the entertainment area of this site to meet your needs if you are hungry and thirsty.